Love is in the air on Netflix! There are countless romantic comedies and romance films to be found currently streaming on Netflix. You probably watched a half dozen over the last weekend even. Below are two new series coming out this month, exclusively to Netflix. These are shows you won’t wanna miss! You have heard the rumors and then it was confirmed. Well the time is here. This is the month that Fuller House debuts on Netflix! February 26th, marks the return of Uncle Jesse (John Hubba Hubba Stamos) and the other guys from the original beloved series. We will be watching, how about you? For the adults, after the kids go to bed is a brand new Netflix series called “Love.” This 10 part series premieres this Friday, February 19th. It’s produced by Judd Apatow, so it’s definitely adults only, but looks hilarious. The series is a “down-to-earth look at dating,” exploring male and female perspectives on romantic relationships through the characters Mickey and Gus. You may just end up binge watching all 10 episodes. The trailer can be found here. It has some salty language but is pretty darn funny, especially if you were a fan of This is 40. What are some of your favorite exclusive Netflix series? Love is in the air! Valentine’s Day is coming up this Sunday and I’m lucky that I was able to have my own very special day at Victoria Gardens. I had the opportunity to plan a very special and pampering day with my family. It was all that and then some! It was also my first time at Victoria Gardens and I can’t believe I have never been there before. It’s practically a little town, with everything that you need and can imagine, in one central location. 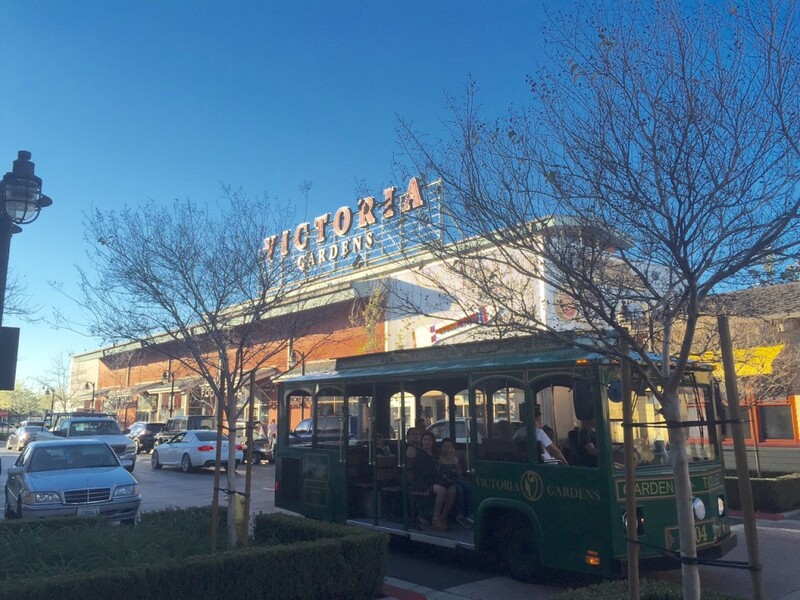 Victoria Gardens is a 1.2 million-square-foot, open-air town center at the heart of a 160-acre, “main street” community. The center consists of retail, office, public plazas and a civic Cultural Arts Center with a state-of-the art library and playhouse. The retail mix includes 170 specialty stores and the largest selection of sit-down restaurants in one place in the Inland Empire. I mean I think I walked past every restaurant imaginable. We started our day out by stopping by for our favorite tea at Teavana. We then decided to go on a nice walk and check out all of the different retail stores at the center. It was so fun. Every retailer that you can think of is there. We wanted something sweet and stopped for chocolate covered strawberries at Rocky Mountain Chocolates. I can still taste them. We then headed for dinner at YardHouse. It is one of my favorite restaurants and I was so excited to find one here! Here is of only a few of the large selection of restaurants at Victoria Gardens. We also had the opportunity to really get our shopping on. I was able to pick up my absolute favorite lotion at Victoria’s Secret, the cutest Valentine’s Day shirts at Justice, and the cutest tops at Forever 21. There is something for everyone there! My husband got a kick out of roaming Bass Pro Shops. I loved shopping for the entire family and discovering the Vans Store. I bought my son his first pair of Vans and I don’t think he will ever want to take them off. We finished off our perfect day at the AMC Movie Theaters. It was truly the perfect day. We almost took a ride in a horse carriage but I forgot my jacket and was too cold. I won’t forget next time! There is a trolley system that takes you around the center. Your kiddos will be all over this! Even I was excited about it. For additional info and store hours head here. This entry was posted in victoria gardens and tagged #VictoriaGardens, #Victoriously i. We love Knott’s Berry Farm for many reasons and here’s one more reason why we can’t get enough of this fun place. From now until March 18th,Knott’s Berry Farm and Susan G. Komen Orange County are working together for the third year to raise money for breast cancer awareness, services and research by offering special “Pink Tickets” and commemorative Knott’s for the Cure t-shirts. We’ve had both friends and family dear to us, be affected by this terrible disease. We love what the Susan G. Komen foundation does to help support survivors and families. One key to helping fight breast cancer is early detection and the Susan G. Komen foundations makes mammograms available to many that are unable to afford them. Supporting a great cause and having fun at a great theme park? Sign me up! For additional details head here. This entry was posted in Knott's Berry Farm and tagged Knott's Berry Farm.